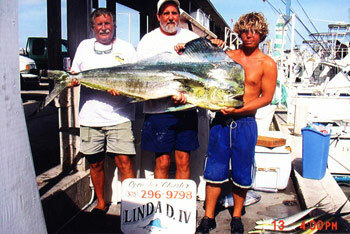 Deep Sea Fishing on The charter boat "Linda D"
Fishing is a family tradition for the Wickers. Capt. Bill Wickers Jr. established the LINDA D. over 35 years ago and followed in his grandfather's and father's footsteps. Now his son, Billy is a 4th generation Captain. 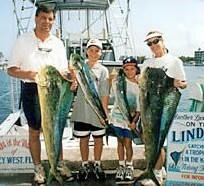 Our family continues to provide the best fishing available in Key West. 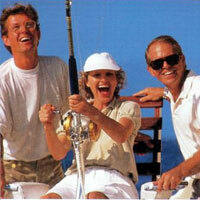 The Linda D. has been featured in numerous films and documentaries including host PM Magazine. The Charter Boat "Linda D IV"
Offshore 40 ft Twin engine Diesel sport fishing boat. Wide beam and great fish raiser. Full bathroom and nice seating to make your day comfortable. The Charter Boat "Linda D V"
Offshore 40 Ft Twin engine Diesel sport fishing boat. Wide beam and great fish finder. Full bathroom and nice seating to make your day comfortable. This boat also has air conditioning. Charter Details on The "Linda D"
Booking a fishing charter on this boat requires a deposit of 20% of the total trip fare to secure a day with the ballance paid in full at the dock upon your charter date. There is a 7 day cancellation policy. Cancellations due to bad weather are the captains descretion. Confirmation of your charter will be sent to you via email after booking. Please make sure your dates are correct before you sign it. Please bring your confirmation with you when you travel.